Reims offers the most important example in France of an entire town in the architectural style of the 1920s. As the town that suffered the most destruction of all the large towns in France by the First World War, logically it also took first place for the number of planning permission applications lodged between 1920 and 1930, with 6,500 in total. In both 1922 and 1923, this number was greater even than in Paris! With 80% of the town having been destroyed, during the 1920s Reims underwent an intense reconstruction phase. 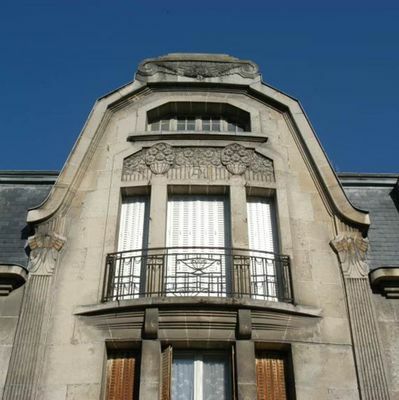 In a context where the compensation was managed by the individual owners without the State or local authorities becoming involved in their choices, Reims was rebuilt with a very wide-ranging diversity of architecture. Thus the town centre of Reims, which suffered particular bombardment, and its suburbs offer a panorama of the major architectural trends of the 1920s in France. Clearly delimited in time, Art Deco reflects a period, between the two world wars, which was marked by profound and rapid upheavals. 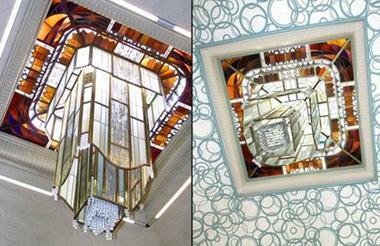 This typically French style followed the exuberance of Art Nouveau, which was primarily ornamental. In contrast, Art Deco reverts to purity of shapes and aims to be both geometric and decorative at the same time. The main characteristics of the Art Deco style for the facades are distinctly geometric in nature: elongated octagons, both vertically or horizontally for small openings or on ironwork, canted walls at 45° in openings, semi-circular openings, serlianas, etc. 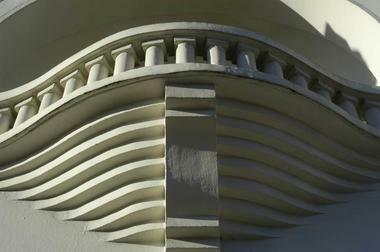 The capitals and Ionic scrolls which were abundantly used in classical architecture and at the end of the 19th century to frame attic windows returned in stylised form to decorate facades and ironwork. The pergola, which reappeared at the beginning of the century for rose gardens, was developed both in gardens and courtyards, and also on terraces, upper storeys and on roofs. The rose, which had appeared in pre-War architectural decoration, was also used along with other plant motifs: baskets of flowers or fruits, used in mosaics, in bas relief or ironwork, and in the latter often simplified to the point of abstraction. Amongst the major buildings of the 1920s period in Reims, we can mention the Carnegie library, Saint-Nicaise Church, Opera for its interior decoration, and the Villa Douce (residence of the President of the University). 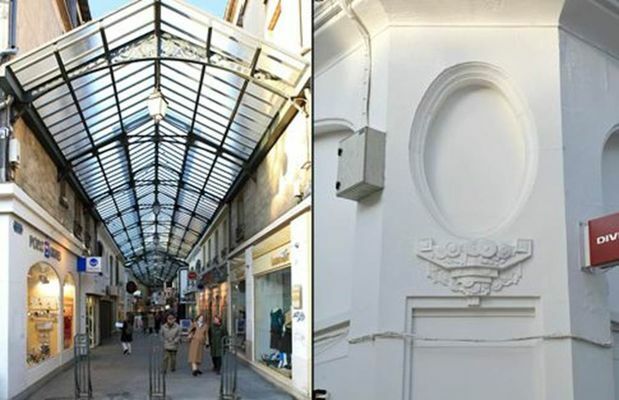 We should also mention the cours Langlet (situated in the axis of the North tower of the cathedral and offering a highly varied catalogue of building designs from the 1920s), the major shops, the hospitals and a dozen garden cities. There is no review about Art Deco Heritage In Reims, be the first to leave one !